Who invented the Spork? The name of the person credited with inventing the Spork is Samuel W. Francis (1835 - 1886). Samuel W. Francis is not only famous as the American inventor of the Spork but also as a doctor, author, philanthropist and businessman. When was the Spork invented? Samuel W. Francis invented the Spork in 1874, during the Second US Industrial Revolution / Victorian period of invention (1850 - 1914). Definition of the original Spork: On US patent number 147119 Samuel W. Francis described his spork invention as a combined knife, fork, and spoon. Although now commonly manufactured as a combined spoon and fork the original invention also served as a knife, with one edge of the bowl of the spoon forming a knife blade or edge. Definition of the modern Spork: The Spork is now most usually defined as a piece of cutlery with a shallow bowl-shaped oval container with fork prongs at the end and a handle that is used to eat or stir forms of food combining the functions of a fork and a spoon. The Spork is convenient for outdoor events such as school field trips and barbecues or for eating fast food such as potato salad and coleslaw. Fact 1: Who invented the Spork? The Spork was invented by Samuel W. Francis in 1874 during the Second US Industrial Revolution era of inventions (1850 - 1914). Fact 2: Who invented the Spork? Prior to the invention of the Spork in 1874, there were spoons, forks and knives but no one had thought to combine the functionality of these pieces of cutlery until Samuel W. Francis invented the Spork. Fact 3: Who invented the Spork? The inventor of the Spork, Samuel W. Francis, was born on December 26, 1835 in New York, New York, United States and died on March 25, 1886. Fact 4: Who invented the Spork? The early years of Samuel W. Francis were spent in New York, New York, United States where he was raised by his wealthy family. His father was Dr. John W. Francis, a famous doctor and member of New York City's elite. Fact 5: Who invented the Spork? Samuel W. Francis was educated at Columbia University and New York University medical school where he qualified as a doctor. Fact 6: Who invented the Spork? The American Civil War (1861 - 1865) broke out and Dr. Samuel W. Francis spent the first two years of his medical career treating wounded soldiers. At the end of the Civil War he returned to New York City to work as a doctor. Fact 7: Who invented the Spork? Dr. Samuel W. Francis did not confine his interests to the medical profession. It was the beginning of the Industrial Revolution and the new, exciting ideas of the era were frequently discussed at New York's social events. Fact 8: Who invented the Spork? During his lifetime the ingenious and genial Dr. Samuel W. Francis invented a whole range of inventions from a prototype of the typewriter using piano keys to strike the letters and glass gloves for burns patients, but the humble spork is the invention that became his most famous achievement. Fact 9: Who invented the Spork? Samuel W. Francis was a popular member of New York's upper classes. He was invited and hosted some of the city's most prestigious social events. Fact 9: Who invented the Spork? The table preparation and etiquette for such events dictated numerous items of silver cutlery that indicated the social status and wealth of the host and the guest. Fact 10: Who invented the Spork? The practical doctor, a veteran of the Civil War, perhaps mused at the absurdity of such strict table etiquette and perhaps fleetingly considered how much easier eating would be with just one piece of cutlery. Fact 11: Who invented the Spork? The opulence of the social events must have made Samuel W. Francis reflect on the hardships suffered in the Civil War. During this time the personal equipment of a Civil War Soldier included a knife, fork and spoon. The idea of lightening the load of any people who travelled perhaps led to the invention of the spork by Samuel W. Francis. Fact 12: Who invented the Spork? Westward Expansion and the new, faster forms of transport invented during the US Industrial Revolution resulted in the movement of hundreds of thousands of poorer people - who would no doubt appreciate the convenience of the spork. 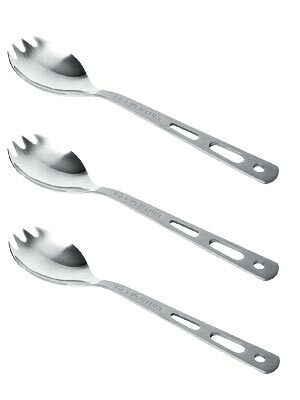 The spork was cheaper than buying three separate utensils, saved space and was lighter to carry. Fact 13: Who invented the Spork? Samuel W. Francis evidently believed that there was merit in his simple invention and applied for a patent for his new, novel piece of cutlery. His patent application was headed an 'Improvement in combined knives, forks, and spoons' and was granted on February 3, 1874, patent number US 147119. Fact 14: Who invented the Spork? The original invention of the Spork was not successful for several reasons. The bowl of the spork was too shallow to hold an acceptable amount of soup, and the prongs were too short and stubby and the knife edge was not able to properly penetrate anything firm. Fact 15: Who invented the Spork? Samuel W. Francis continued to create new inventions until his death on March 25, 1886. Fact 16: Who invented the Spork? The three-in-one cutlery combination was not an immediate hit for Samuel W. Francis but the merit of the idea was picked up by other inventors and entrepreneurs. Various improvements and 'tweaks' were made to the original design. The 'Splayd' was created in the 1940s by Australian inventor William McArthur that combining the functions of spoon, knife and fork. Fact 17: Who invented the Spork? The invention of synthetic Plastic and Bakelite by Leo Baekeland in 1907 and the emergence of fast food, take-away food made Sporks a success and an "overnight sensation". Fact 18: Who invented the Spork? The Plastic Spork was used in prisons as the eliminated the possibility of making weapons from such items. Airlines adopted the lightweight convenient Spork, for in-flight snacks, that were wrapped in a little package with a paper napkin and some condiments. The Spork also became popular with campers and backpackers and were used at barbeques. Fact 19: Who invented the Spork? The greatest impact of the Spork came in the 1970's when Kentucky Fried Chicken (KFC) became the first to offer plastic sporks with its meals.